Have you heard of Teach For Canada? It’s a new project spearheaded by Nova Scotian Kyle Hill, a Rhodes scholar and business consultant; and Vancouver-born Adam Goldenberg, former speechwriter for Michael Ignatieff and fellow at Yale law school. Hill and Goldenberg want to address “educational inequality” in Canada, i.e. “[f]unding gaps, infrastructure deficiencies, and rapid teacher turnover” in rural and Aboriginal communities. Their solution? A program that would send university graduates (from any degree program) to work as schoolteachers for two years in these communities. Hill and Goldenberg hope to attract “some of Canada’s top graduates – our country’s future leaders” to their program, who would take their places in classrooms following a summer-long training period. Teach for Canada takes its name from Teach for America (TFA), the U.S. program which for the past 23 years has sent bright-eyed young college grads into some of America’s toughest inner-city schools; schools where students tend to score lower than average on standardized tests and thus ostensibly need a dose of extra energy to succeed. TFA, though, has become a lightning rod for controversy in the climate of the “education reform” wars in the U.S. Just maybe, critics note, sending people with no experience in education except a short summer training program into some of the U.S.’s toughest, most down-and-out neighbourhoods is not such a great idea, especially if these young, relatively inexpensive teachers take the place of more experienced teachers during a round of layoffs. While a minority of TFA corps members go on to work in education beyond their two-year commitment, others quit the program before its end. Some corps members and alumni have raised grave concerns about the quality of their training program and (lack of a) support network, particularly with respect to TFA’s “diversity training” sessions (the majority of TFA corps members are white while 90% of their students are black or brown). Recently some anti-TFA campaigns have appeared at major American universities, and in Pittsburgh parents and teachers lobbied successfully to keep TFA out of their schools. Perhaps most importantly, TFA enjoys a cozy relationship with the corporate-driven “education reform” movement, which advocates standardization, privatization, “school choice,” charter schools and merit pay as solutions to what ails inner-city schools. These deep-pocketed “reformers” oppose teacher unions, painting them as the root of all problems in education, and tend to ignore or downplay un-glamorous but important structural issues like poverty and racism. What about Teach for Canada? The nascent program (let’s call it TFC) appears to be walking an awkward line between using the “Teach for” name while distancing itself from TFA’s controversies. On its FAQ page TFC insists it is not “just Teach for America in Canada,” drawing distinctions between TFA’s work in the inner city – in most major Canadian cities many young teachers struggle to find full-time work – and its own focus on rural and Aboriginal communities. TFC also notes its training program lasts “an entire summer,” compared to TFA’s five weeks. Perhaps even more importantly, Bower points out that TFC co-founder Kyle Hill’s employer, the Boston Consulting Group, is a firm with its fingers in school corporatization initiatives all over the U.S.
TFC’s desire to work in Aboriginal communities is of particular concern. Of course it’s true, as TFC notes, that there are deep inequalities between education on reserves and in urban centres in Canada. However, the idea that a solution for this is to parachute inexperienced, mostly non-Indigenous people into schools in these communities ignores the fact that Aboriginal communities have been leading the fight for decades to take their children’s education into their own hands. Following years of localized advocacy, the first major, nation-wide policy statement came in 1973 when, in response to Canada’s unthinkably destructive residential school policy, the National Indian Brotherhood (precursor to the Assembly of First Nations) released Indian Control of Indian Education, a document which demanded local control and culturally appropriate education for Aboriginal children. 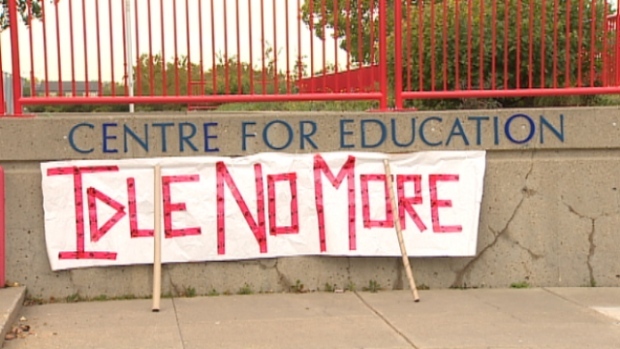 Since then the AFN along with other Aboriginal leaders have consistently lobbied the federal government for implementation of the policy, today updated as First Nations Control of First Nations Education. It’s hard to see Teach for Canada as anything but a continuation of these paternalistic, colonial attitudes. Indigenous scholars like Marie Battiste have spent careers working for the development of culturally appropriate Indigenous education in a modern context. Aboriginal-run programs like Mi’kmaw Kina’matnewey in Nova Scotia have seen considerable success at raising graduation rates. Yet TFC seems to think that it – not equitable funding, not Aboriginal control over education – is what is needed to fix educational inequities. Teach For Canada’s directors are slick marketers and apparently well-connected – a recent Globe and Mail article reported that its launch, held at the offices of an influential corporate law firm in Toronto, was attended by Peter Mansbridge and Indigo CEO Heather Reisman. Slick marketing isn’t what’s needed to fix educational inequities in Canada, however. That requires adequate funding, a commitment to Aboriginal-led education, and the addressing of structural issues like racism, poverty and inequality.